Disconnect the positive crankcase ventilation pipe from turbocharger. 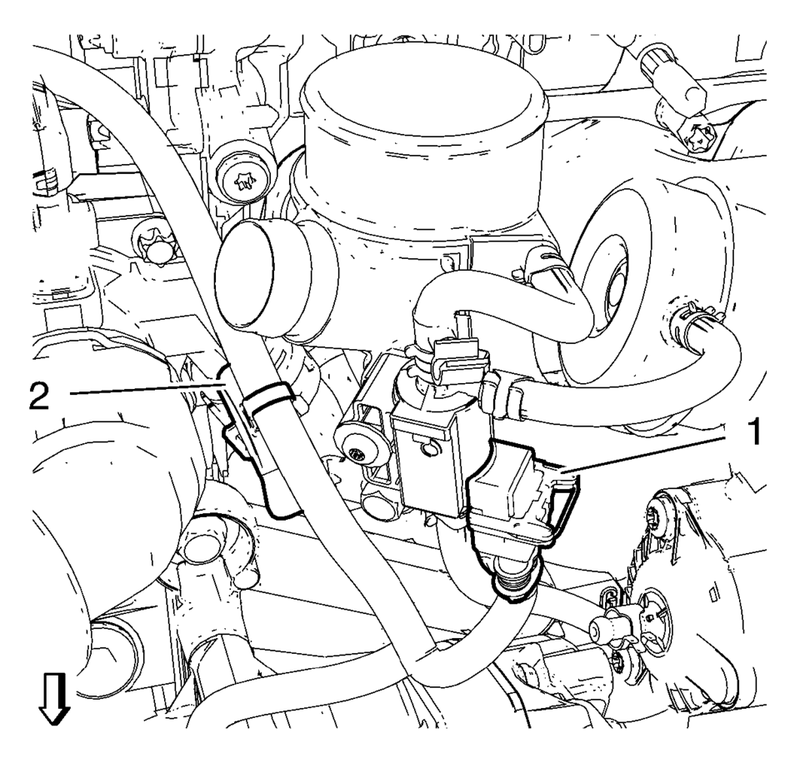 Disconnect the turbocharger wastegate regulator solenoid valve wiring harness connector (1) and unclip wiring harness from retainer clip (2). Remove the turbocharger oil feed pipe hollow screw (4). 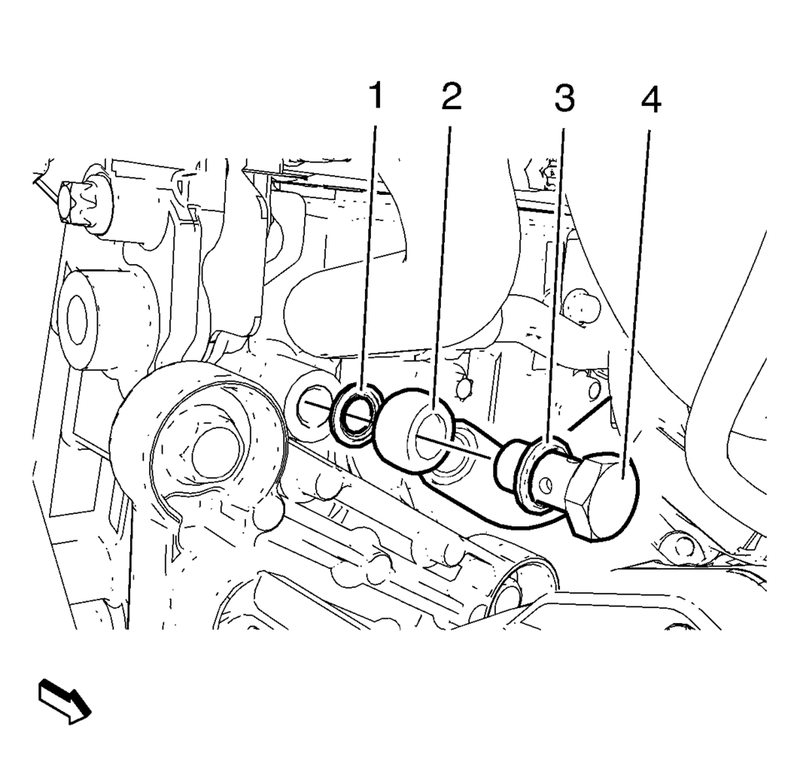 Remove and DISCARD the 2 seal rings (1) and (3). Close the screw bore in the turbocharger in order to avoid contamination. Remove the turbocharger oil feed pipe (2). Loosen the turbocharger coolant return hose clamp and remove the turbocharger coolant return hose (6) from the oil cooler inlet pipe. 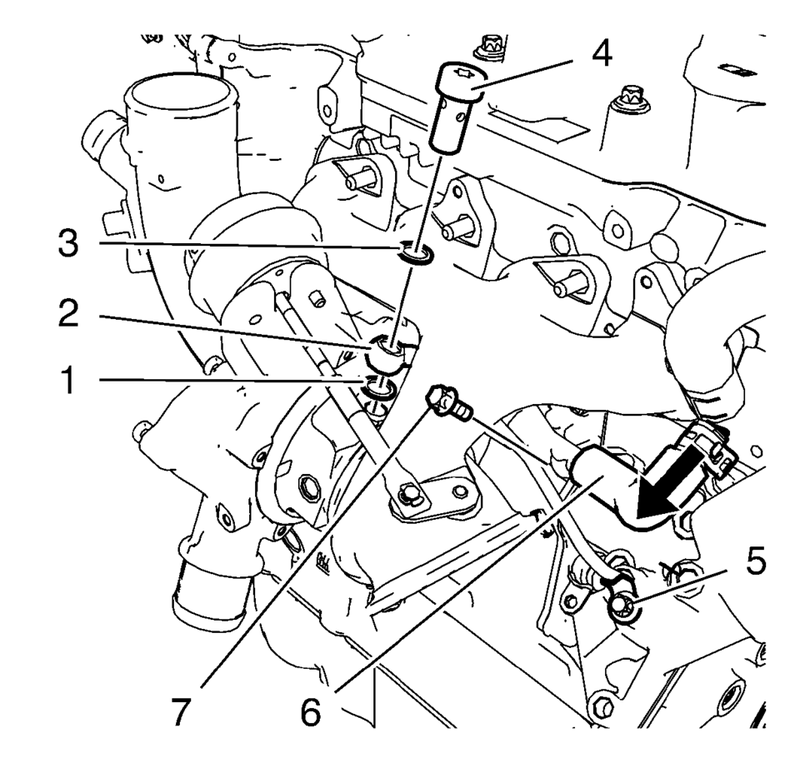 Remove the turbocharger coolant return pipe bolt (7). Remove the charge air cooler inlet air hose from the turbocharger. Refer to Charge Air Cooler Inlet Air Hose Replacement. Remove the air conditioning bracket. Refer to Air Conditioning Compressor Bracket Removal. 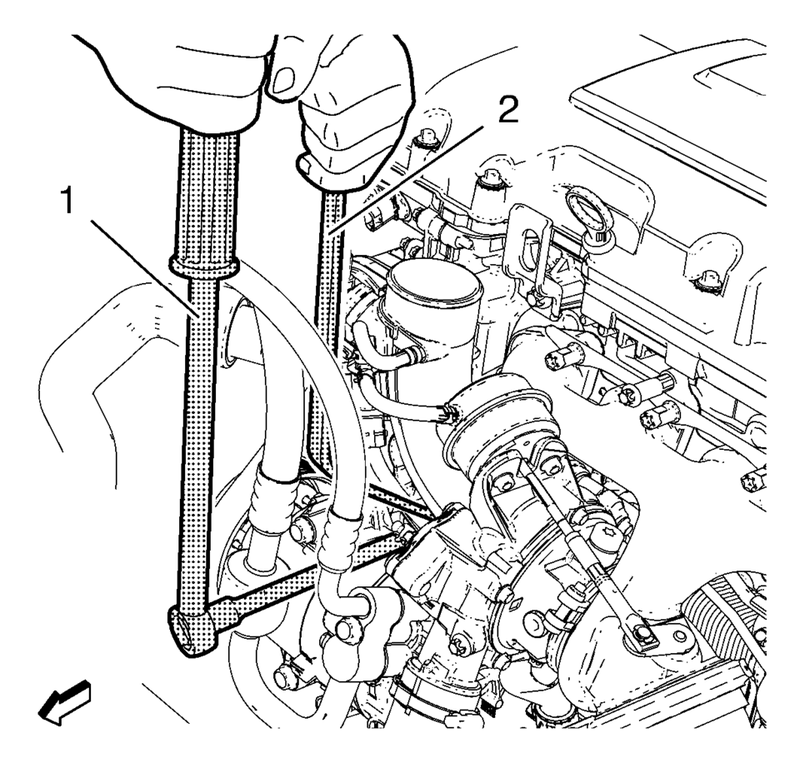 Install the EN-49942 holding wrench (2) to the turbocharger coolant feed pipe. 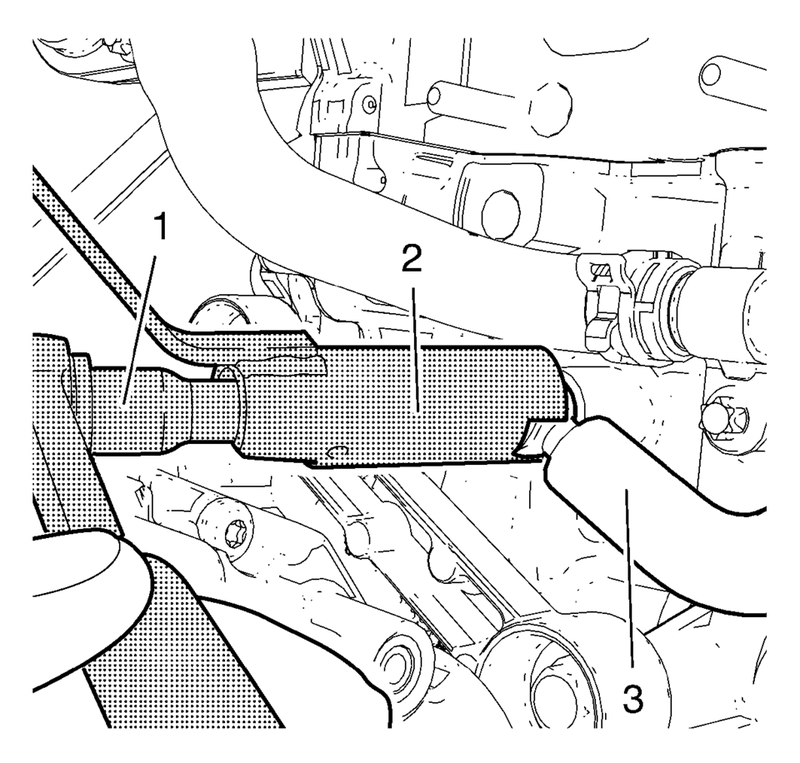 Guide a ratchet wrench (1) along with an extension through EN-49942 holding wrench to the turbocharger coolant feed pipe hollow screw. EN-49942 holding wrench (2) should be installed to turbocharger coolant feed pipe as shown. The holding wrench should be installed to avoid twist of the turbocharger coolant feed pipe during the loosening procedure. Remove the turbocharger coolant feed pipe hollow screw. Remove and DISCARD the 2 seal rings. Remove the 2 turbocharger oil return pipe bolts (1) from turbocharger. Remove the turbocharger oil return pipe from the turbocharger. Remove and DISCARD the gasket. It is only necessary to move the wastegate actuator aside enough to access the manifold nuts. Remove the wastegate actuator nuts and set aside. Remove and DISCARD the 8 turbocharger nuts (1). Remove the turbocharger assembly (1). Remove and DISCARD the turbocharger gasket (2). Remove the assembly parts from the turbocharger as necessary. Refer to Turbocharger Disassemble. If the turbocharger is being reused, refer to Turbocharger Cleaning and Inspection. Install the assembly parts to the turbocharger as necessary. Refer to Turbocharger Assemble. Install a NEW turbocharger gasket. Install the turbocharger assembly (1). Install the 8 NEW turbocharger nuts (1). Repeat the tightening procedure to ensure a proper fastening of the turbocharger nuts. Install a NEW seal ring (3) to the turbocharger coolant feed pipe hollow screw (4). Install the turbocharger coolant feed pipe hollow screw along with the seal ring to the turbocharger coolant feed pipe (2). Install a NEW seal ring (1) to the turbocharger coolant feed pipe hollow screw. Install the turbocharger coolant feed pipe hollow screw along with the turbocharger coolant feed pipe and the 2 seal rings to the engine. 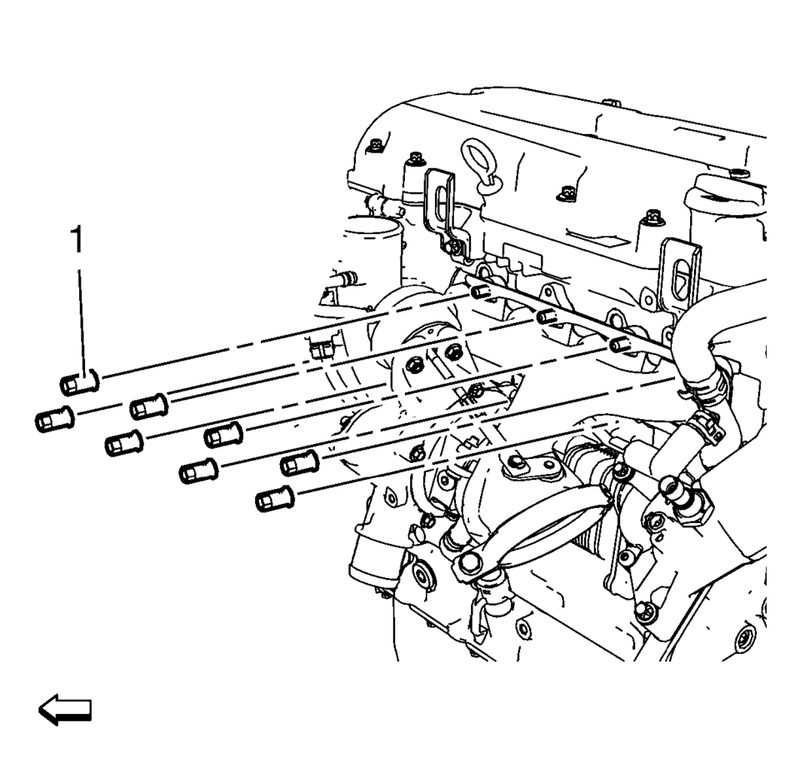 The EN-49942 holding wrench should be installed in a perpendicular position as shown to ensure a proper installation position of the turbocharger coolant feed pipe. Install the air conditioning bracket. Refer to Air Conditioning Compressor Bracket Installation. EN-49942 holding wrench (2) should be installed to the turbocharger coolant feed pipe as shown. The holding wrench should be installed to avoid twist of the turbocharger coolant feed pipe during the fastening procedure. Install the charge air cooler inlet air hose to the turbocharger. Refer to Charge Air Cooler Inlet Air Hose Replacement. Install the turbocharger coolant return hose (6) to the oil cooler inlet pipe. Install the turbocharger coolant return hose clamp. 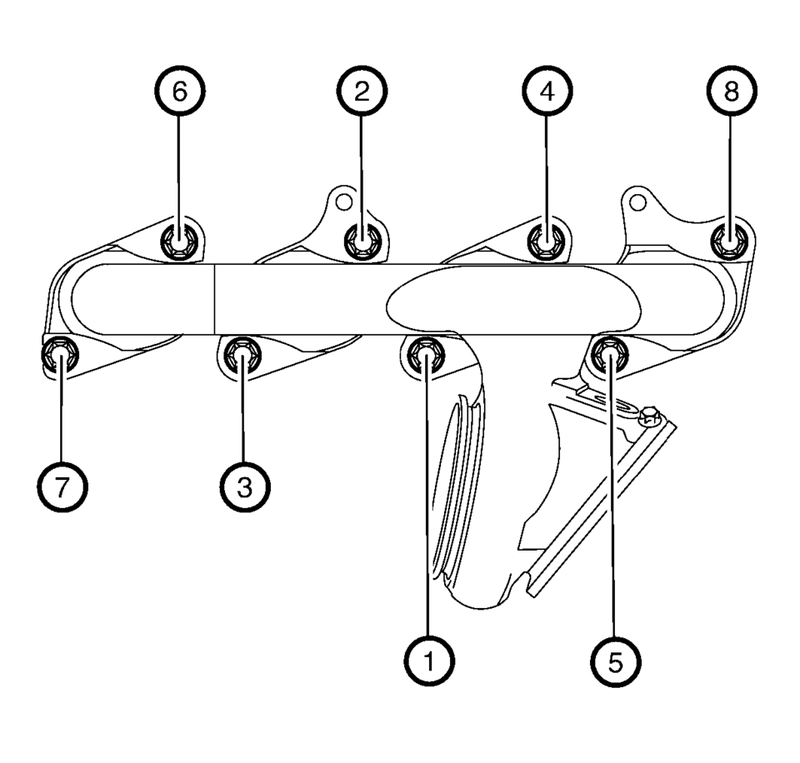 Install the turbocharger oil feed pipe (2) to the oil cooler and the turbocharger. Install the turbocharger oil feed pipe bolt (5). 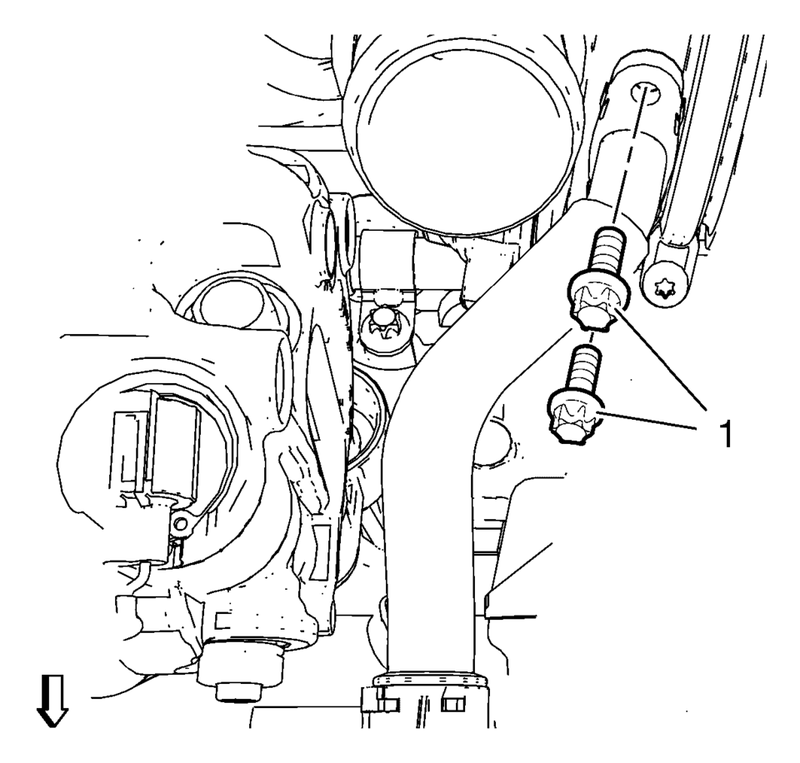 Connect the turbocharger wastegate regulator solenoid valve wiring harness connector (1) and clip in wiring harness to retainer clip (2). 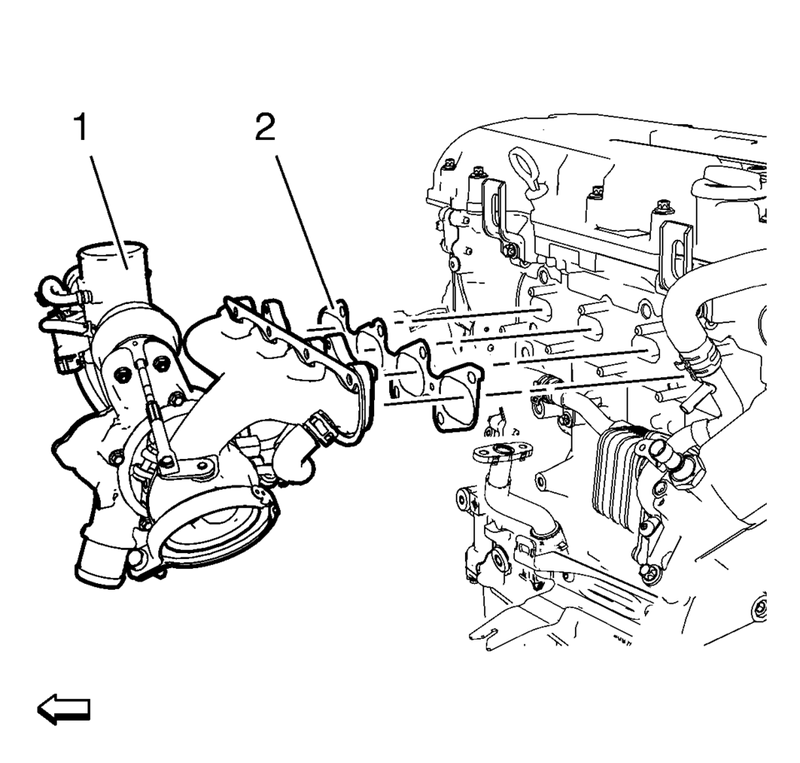 Connect the positive crankcase ventilation pipe to the turbocharger. Use a scan tool to perform the Engine Control Module Setup for Component Replacement. Refer to Control Module References.